Your first month is free of charge! All newcomers get their first month free of charge. To start, simply show up for any of our classes, or feel free to contact us ahead of time. Wear long-legged gym or loose fitting clothes if you don’t already have a gi and expect to be bare-footed on a soft mat. 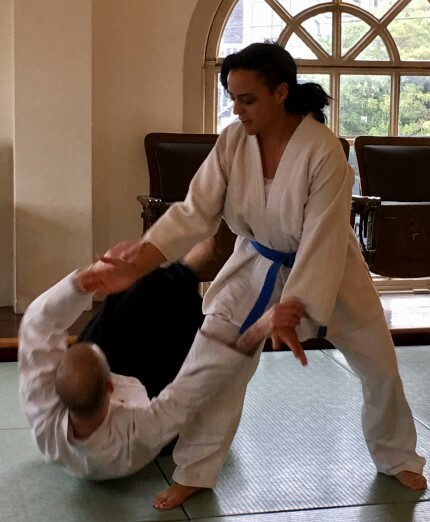 The first free month allows newcomers enough time to safely learn the basics of Aikido, how the philosophy of harmony and nonviolence is expressed in the techniques of Aikido and to evaluate whether they’d like to continue their training with us. We recommend that newcomers aim to attend at two classes per week. Our instructors are very good at tailoring each session to the various skill levels of the students present, so that everyone benefits from the class. For beginners, special attention and care is given by both instructors and advanced students, toward developing the basics safely and comfortably. Caring for everyone’s safety and well-being is at the heart of our philosophy. Our dojo’s members span a wide range of physical fitness, capability, and age. Everyone is welcome to come try aikido with us. A dojo is a place to train, but it is not a gym. Think of it as part-club, part-school. As a club, our members can attend any of the scheduled weekly classes. 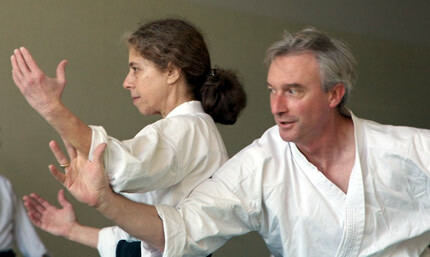 As a school students practice under the guidance of experienced teachers of the lineage. Aikido is a partnered practice and our collective membership provides us with bodies to train with, and a rented space to train in. Dues to support the dojo are paid by members monthly. 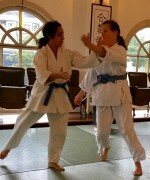 Like in many other arts, proficiency in aikido comes with years of training. While students and in earlier times in Japan would commit to lifelong practice, as a modern dojo in San Francisco, we ask members to commit on a monthly basis. 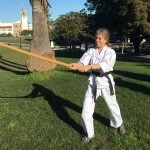 If you have any questions, feel free to send an email, or call Penny Sablove Sensei at 415-910-5757. Also please refer to our FAQ page. You may also learn more about Aikido from our list of suggested books.